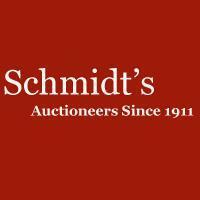 Schmidt's Antiques Ypsilanti, Michigan is a 5th generation family owned Auction Gallery and Antiques store. We are celebrating over 100 years in the auction business, having first opened our doors in 1911.
from Detroit and Toledo, and midway between Chicago and Cleveland. fast paced sales of mid range Antiques and Collectables all gathered from local Estates and Collections, these are un-catalogued auctions with no buyer's premium, sort of like a high speed consignment shop with 400-500 new items each month.